Wet n Wild and BEUTiFi Blogger Brunch! Wet n Wild is yet another American brand that has launched in Ireland this year (woo!) and over the weekend, I was at the BeutiFi.com and Wet n Wild Beauty Brunch, organised by the lovely ladies at the Publicity Loft. The event was super casual, I got to chat with some of the other beauty bloggers, munch on some delicious treats (the chocolate strawberries were to die for! ), and test out some Wet n Wild makeup, before Lisa Molloy from Pink Sugar Sparkles taught us how to do some super easy (unless you have hair like mine!) 5 minute hair styles, such as the fishtail braid. After that, we were introduced to this cool new site BeutiFi.com, which is a site that allows you to find hair and beauty salons anywhere, at any time and for absolutely any occasion. They have a huge database of hair and beauty salons, making it so easy for you to find and book one that works for you. It’s basically the trivago of the beauty world here in Ireland, and I think it’s an amazing idea! Last of all, make-up artist Sarah Lanagan gave a few make-up demonstrations. She showed us the A/W trend for this year (berry lips and sculpted cheeks), a quick an easy smokey eye and also gave tips on how to achieve perfect eyeliner wings. We all got goodie bags containing some Wet n Wild goodies, and I’m so excited to try everything out! I’ve already tested out this gorgeous neon orange nail polish (it's much brighter than the photo shows) from the Pop Art Craze Collection, which you can get at Pennys/Dunnes for €3.99 a bottle. To finish my Wet n Wild filled day, I decided to have a look in Dunnes to see if I could find a certain lipstick I’d been lusting after for the past week. The weekend before, I had looked in 5 different shops trying to find the beauty that is Sugar Plum Fairy, with no luck. I finally found it on Saturday, and I picked up an extra one for my sister too. It’s such a stunning colour, perfect for autumn, and it’s an exact dupe of Mac’s Rebel, and so much more affordable (€2.99). The only difference is the finish, Rebel has a satin finish whereas SPF is a matte. If you've been eyeing Rebel but were waiting for a cheaper alternative, GET THIS! If you can find it, that is! I was at the launch party of US cult oral care brand, Hello, on Tuesday night with Publicity Loft and National Beauty, where I was introduced to a great new range of oral care products! So far there are two products in the range, a mouthwash and a breath spray. What makes them different from other mouthwashes/breath sprays is that they actually taste nice! The products are free from any artificial colours, sweeteners, alcohol and harsh chemicals. The ingredients are 99% natural, and according to Craig, the founder and CEO of Hello, they are even safe to drink! There's no child lock cap on the product, it's just not required because its so safe! The mouthwash and breath spray come in three flavours: Super Mint, Mojito Mint and Pink Grapefruit. I've tried the Mojito Mint and Super Mint mouthwashes. Super Mint, as name implies, is quite minty. but without burning sensation left by the likes of Listerine. It's actually quite refreshing! Mojito Mint isn't as minty, but tastes really nice (never had a mojito so wouldnt be able to compare the tastes!). What I love most about these are that they don't leave you feeling like you've just set your mouth on fire, like most other mouthwashes do. The packaging of the mouthwashes is also so different to anything else in the market. The bottles are round, colourful, eye-catching. They aren't off-putting in any way, like other mouthwashes are with their rigid, square and clinical packaging. The design even won the brand the prestigious GOOD DESIGN AWARD. The design was a result of a collaboration between Hello and DesignWorksUSA, who are the global design consultancy of BMW. The range is available in McCabe's Pharmacy and Sam McCauley Chemists nationwide. The mouthwashes are €7.50 a bottle and the breath sprays are €4.75 each. Physician's Formula is another American brand to recently reach our shores, and also one that I've been wanting to try out for a while. So you can just imagine how excited I was when I was sent their Mineral Wear Correcting Powder to review! It also came with a little mirror and brush, but I didn't use either of them. The powder didn't come with any sort of instructions, so I hopped onto the Physician's Formula site to see the product claims, and directions for use. According to the website, the powder serves as a 3-in-1 corrector, primer and powder. It claims to smooth out skin texture and even out skin tone, with the red bit brightening, the green toning down redness and the yellow adding warmth. The website also says that you can wear the powder either on its own or over make-up and it is recommended that you apply moisturiser before putting on the powder if you have drier skin (which I do). I tried it out three ways: under foundation (as a primer), over foundation and on its own., using my Etude House Collagen Moistfull Cream underneath each time. They said it worked as a primer so I wanted to try it out as such too. I wouldn't recommend using it under foundation, it really clings to any dry patches you might have. Over the foundation, it did look a bit weird at first, but after blending out with a damp beauty blender sponge and letting it set for a few minutes, it actually looked quite nice. It gave a nice finish, really smoothed everything over. There was still the tiniest bit of dryness on my forehead, but you'd only notice that if you looked reeeeeeally close. By far my favourite way of using this powder is on its own. I apply my moisturiser, then using a big fluffy powder brush, I apply it all over my face (as evenly as I can! ), using a slightly damp beauty blender sponge to blend it out. It evens out my skin tone, neutralising the little bits of redness around my nose, on my cheeks and on my forehead. It leaves my skin looking flawless, but natural at the same time. It's also so lightweight, it doesn't feel like you've put anything on at all. I've been using this everyday for the last three weeks or so, it's become one of my favourite everyday products. I was pleasantly surprised by how much I love this stuff, and also by how well it worked for me. Having dry skin, I was a bit apprehensive about using this at first, but all of that went away quickly once I slapped on the powder. Don't knock it before you try it I guess! It's becoming clearer and clearer that I am completely OBSESSED with Etude House products. From the cute packaging to the great quality of the products themselves (and the super affordable price tags! ), there really isn't anything not to love. Today's post is all about their Collagen Moistfull Cream (60ml), which I've been using for about 2 weeks now. The one I got came with a 'free gift' in the form of the Ampoule Essence (20ml), also from the Collagen Moistfull line. I haven't really used it much, just because I wanted to test out the cream by itself first. The product promises to "hydrate for a youthful, water bouncy skin." First thing I have to mention is that it's got more of a gel texture than a cream one. It's really thick and gloopy, it doesn't feel like a cream at all. As a result, it does look and feel quite oily at first, but rest assured it settles quickly, and the oily feeling goes away. While that greasy feeling does go away within a minute or two, the shininess does stay a few minutes longer, but that too settles down quickly. It comes with a little scooper thing in the box, which I used to scoop some product onto the back of my hand. Using my fingers, I then applied to my cheeks, forehead, chin and nose, rubbing it in and then patting to finish. After using it for two weeks I noticed that my skin did feel great, and it looked really healthy too. I applied this both in the morning and at night. My skin is slightly dry, especially on my forehead and around my nose, and this worked wonders at hydrating those areas. At first, even though I did like the product, I thought I wouldn't really buy it again. It didn't seem like anything special. But after my two week trial, I spent a week away from it and realised that I actually quite liked how my skin looked after using it: fresh, healthy and hydrated. So I think once this runs out, I'll definitely be purchasing it again. I have to say that I do love this stuff, even more than my Simple moisturiser, which I mentioned in my July favourites post. I don't really like products that just feel like a layer of grease sitting on my skin for ages, but this absorbs into my skin quite quickly, so I can't even fault it in that regard. Dry skinned ladies, you'll love this! I got this set on eBay for around €11. I've been wanting to try out Nyx lipsticks for a long time now, and when I heard Nyx was making its way to our shores, I was so excited! What I actually wanted to try were the Butter Lipsticks, but they didn't have them in my local Bradley's. They did have the Butter Lipglosses, but, being more of a lipstick girl, I decided to skip on those for now. I went for the Extra Creamy Round Lipsticks instead. I'm a huge fan of red lipstick, so I picked up two red shades: Eros, a bright coral red, and Snow White, a deeper, darker red. Both lipsticks glide on really nice and smooth, and are super opaque in just once swipe. They have a nice creamy finish, they don't leave your lips feeling dry, which was extremely important for me considering I already have quite dry lips. They aren't very long lasting though, and they do transfer, especially if you eat or drink something. I didn't find I had any issues with bleeding, but I think if I were going to wear these out I'd pop on a little bit of liner, just to be on the safe side! 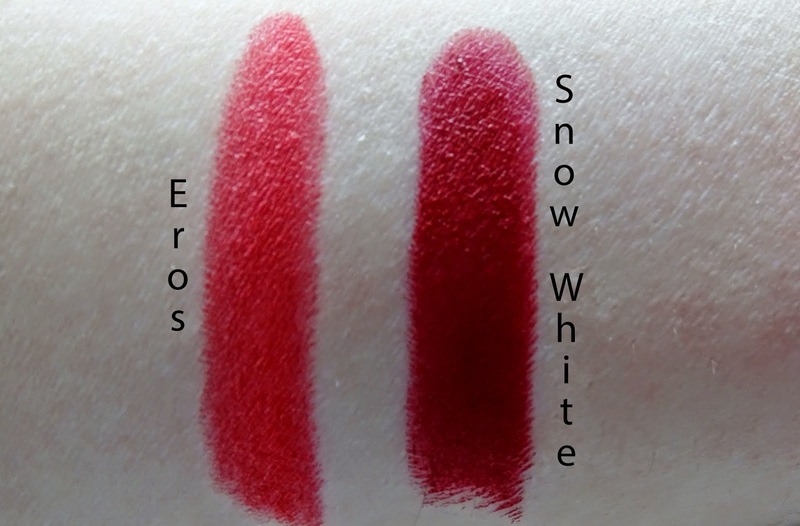 Eros doesn't have a scent, but Snow White does. It smells a bit like Vicks in the tube, and I have to say, I really don't like it. The smell doesn't linger once applied though, which is a relief. Overall, I do love both shades and I think they're worth the €5.49 you pay for them. I got these in my local Bradley's Pharmacy. Super Aqua Pore Correcting Blackhead Melting Oil Gel. Damn, is that a mouthful or what? So, I bought this about a month ago, after watching a review on it on YouTube. I'd really just used pore strips before this, but I don't think they ever really did anything. After seeing the review, I was really eager to try this out and literally once the video was finished I hopped onto eBay and ordered one. Missha claim that this soft oil cleanser will melt blackheads and excessive dead skin cells, while also combating various other skin issues, such as excessive sebum and dirt. I absolutely love the packaging of this product! Something about the mix of the blue and silver, combined with the slightly flat-ish shape just makes the bottle look so much more fancy and expensive than it really is. The only thing I don't like about the packaging is that it seems like it could crack easily. "After washing the face, dry your skin and pump an appropriate amount. Apply and roll it on the desired area as if massaging. After 20~30 sec., wash it off with lukewarm water. Keep the silicon brush clean after using." I've been using this for about a month now, right at the end of my showers. I'd push the button to let some product out, kind of just rub the brush around my nose and chin, leave on for about a minute before washing it all off. The first few times, I didn't really notice any difference. It would feel warm on my chin, but that's about it. It didn't feel like anything was happening on my nose at all. But after using it for about two weeks, I really started to notice the difference. My nose and chin felt so smooth and soft, and its visibly obvious that the amount of blackheads has decreased by a lot. My dear mother even commented on how great this was working, saying that I "always had so many blackheads on my nose." This stuff worked wonders on me, I absolutely love it. My skin feels so clean and smooth after using it, and I'm so happy with the result it has had on my blackheads. I would 100% recommend it if you're looking for something to help with blackheads. The bottle contains 20ml of product, and a little goes a long way with this stuff! I got mine on eBay for around €11.